At all times stay away from an application known as SysWeatherAlert. Keep in mind that it is just one more ad-supported program that should never be active on your personal computer. If unfortunately, it is ever found running on your PC, you should take immediate measure to remove its every single bit of it. If you were wondering why do you see an unusually large amount of invasive third-party web content while surfing the web – SysWeatherAlert is most likely the problem. What is unfortunate, is that its developers tend to use devious and misleading marketing techniques; they claim that this piece of software can provide you with an actually reliable weather report. Even if such functionality might sound excellent, be sure to avoid this application at all costs. Below we provide a detail removal guide that you must use to delete every single bit of this adware as well as we provide our further findings regarding its invasive functionality, which should make you realise that having SysWeatherAlert active on your PC is not a good idea. After conducting a thorough research, our malware experts have noticed that the basic functionality of SysWeatherAlert is not that different compared to its counterparts. As soon as this adware is able to infiltrate your operating system, you will notice a significantly larger amount of web advertisement within your browser, which is extremely annoying, to say the least. In most cases the content provided by this invasive application will be random and irrelevant, meaning that it will only disrupt your online experience. All of it comes from tons of adware servers, which are infamous for being the main source of such unwanted web content. All of this is possible because the adware program in question outs its files within the %PROGRAMFILES% folder, and then it starts a silent background system service that initiates numerous connections to those suspicious servers. The silent service works with files and registry entries associated with SysWeatherAlert to function properly. This is the main reason its complete removal is essential. If you happen to kill the service only or delete the folder hosting its files or traces within the registry system could not be enough to stop it from. Thus, do not hesitate and follow the removal guide that we present below; it will allow you to remove SysWeatherAlert without encountering any major problems. If all of that was not enough, it has been discovered that SysWeatherAlert could cause so much more than major disruptions within your web browser. Our malware experts have found out that in some cases the content presented by it could turn out to be more than just annoying. At times, you could be presented with ads, pop-ups, or coupons, that might turn out to be hosting redirect links. This signifies that by clicking on it, you will most likely be taken to some third-party questionable website. Even though some of those sites might be literally useless, you must be aware of the fact that in some other cases, you could be taken to websites, which could turn out to be hosting malicious software. It goes without saying that just a possibility of ending up on such a site like that imposes various dangers to your overall online experience on many levels. This is why we advise you to stay away from anything that SysWeatherAlert might present you with and to remove it without any hesitation. It will not only cause annoyance and frustration but might expose your operating system to suspicious third-party web content, which could result in rather detrimental outcomes. Do not take the whole removal procedure of SysWeatherAlert lightly since one mistake could mean that the malicious piece of software was not removed entirely. You do not want to find yourself in such a situation. If even a few traces associated with SysWeatherAlert are still fully active on your computer, the adware might be able to continue its dubious functionality or worse – could silently restore itself. 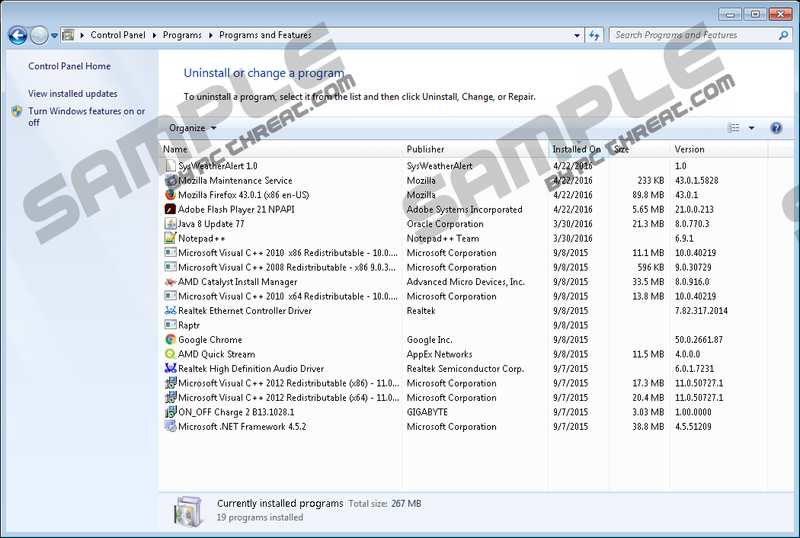 If you wish to avoid such situation, make sure to analyze your PC for traces of this adware right after the manual removal. In other cases, we recommend performing the removal procedure using a professional antimalware tool. Select the folder called ProcessSysWeatherAlert and remove it. Remove the folder entitled SysWeatherAlert. Now click the Windows button. Go to HKEY_LOCAL_MACHINE\SOFTWARE\Wow6432Node\Microsoft\Internet Explorer\MAIN\FeatureControl\ FEATURE_BROWSER_EMULATION. Select and remove the registry value SysWeatherAlert.exe. Remove the registry value called SysWeatherAlert.lnk. Quick & tested solution for SysWeatherAlert removal.